I’ve always felt holiday desserts needed to be spectacular, especially if having a sit down dinner party. Trying to come up with new and unique twists on old favorites is a simple way to achieve that. Think of your favorite holiday desserts and how you can change them up. 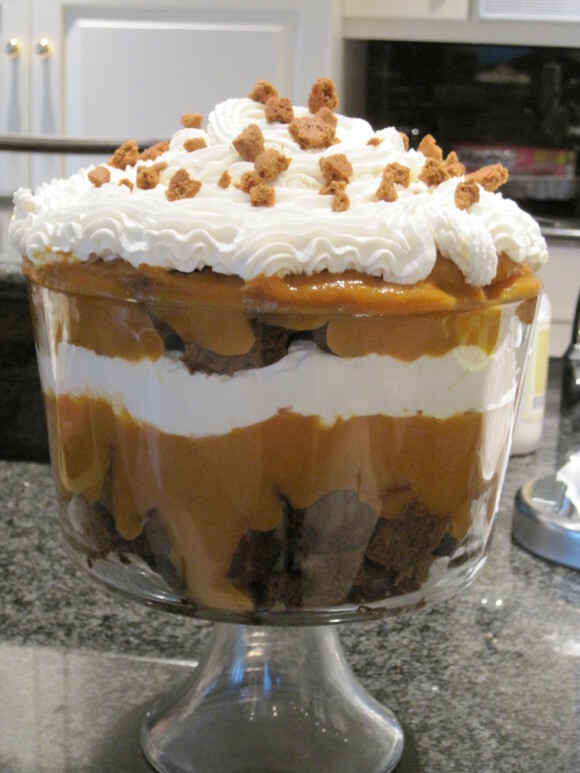 A cake can be cubed and placed into parfait dishes. 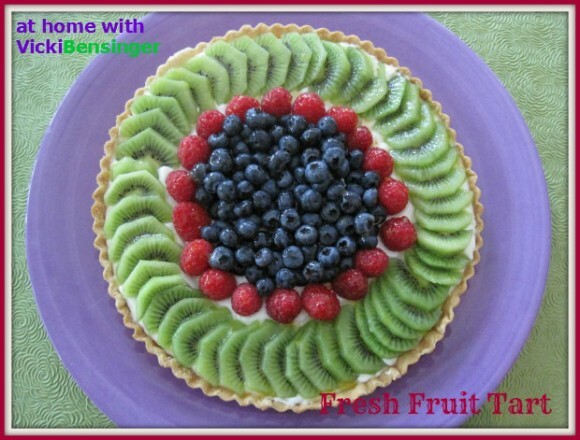 Simply add whipped cream and berries instead of covering it with icing, to make it lighter and more festive. 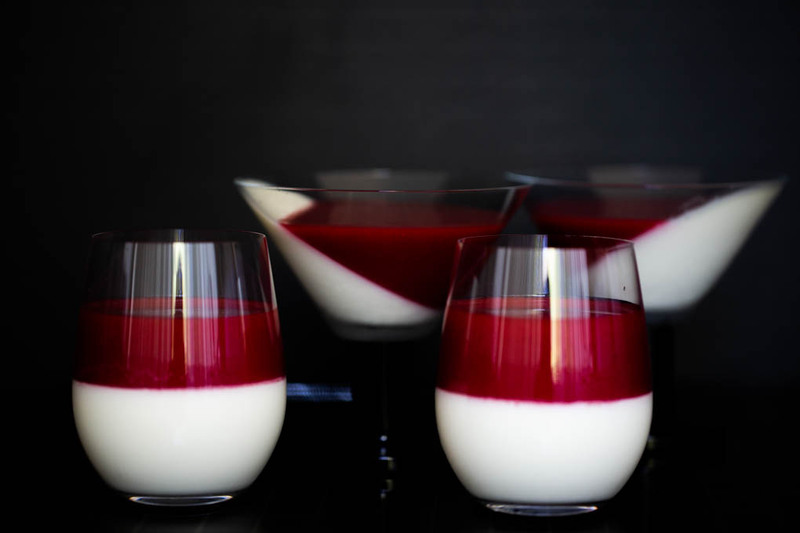 In this Easy Panna Cotta with Raspberry Coulis I tilted two of my serving glasses to a side to first mold the cream mixture, then just before serving added the raspberry coulis, creating these stunning desserts. 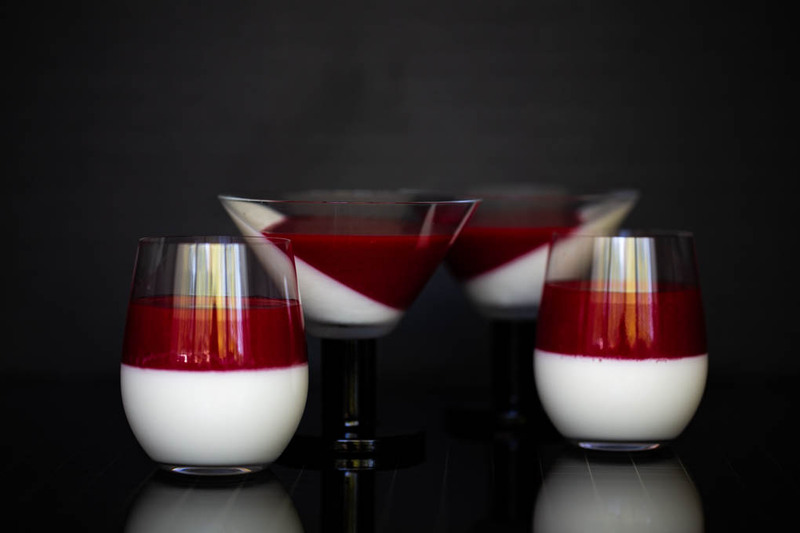 Tilting the glasses certainly looks more spectacular than having the Panna Cotta and Coulis straight across, wouldn’t you agree? 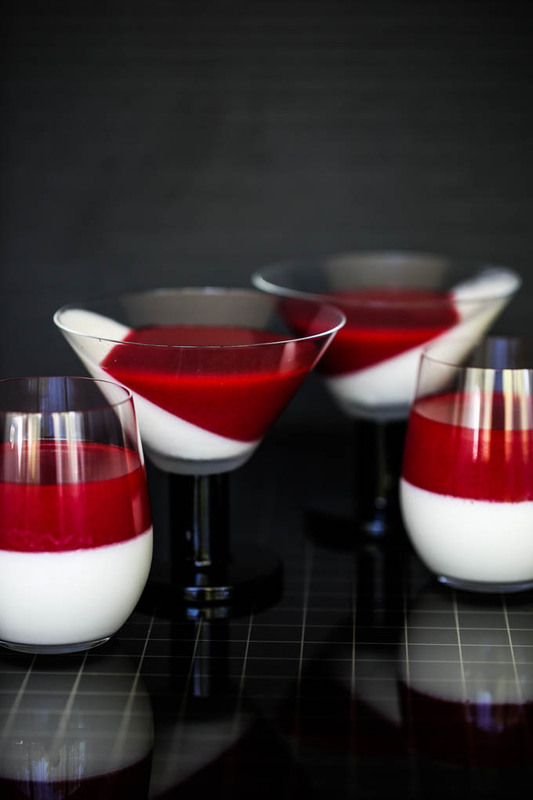 Panna Cotta is an Italian dessert of sweetened cream, thickened with gelatin, and molded. The cream may be aromatized with coffee, vanilla, or other flavorings. To offset the richness of the cream mixture, pairing it with a fresh raspberry coulis (or other berry) makes for a decadent ending to any meal. 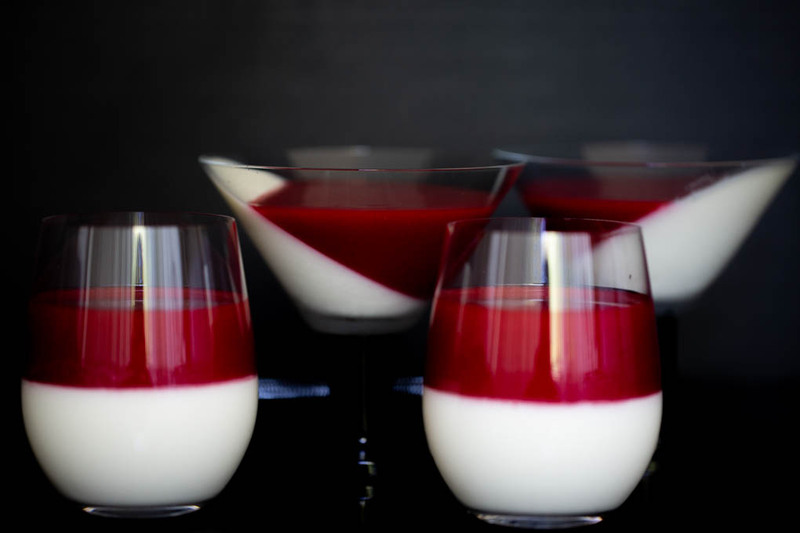 Since Panna Cotta is rich, take into consideration your menu to insure it’s a pleasing way to finish off the evening. The holidays may be everyone’s favorite time to indulge, but keep in mind if you stuff everyone to the rim, your party-goers may feel the need to leave your party early. Of course for some that could be what they desire. 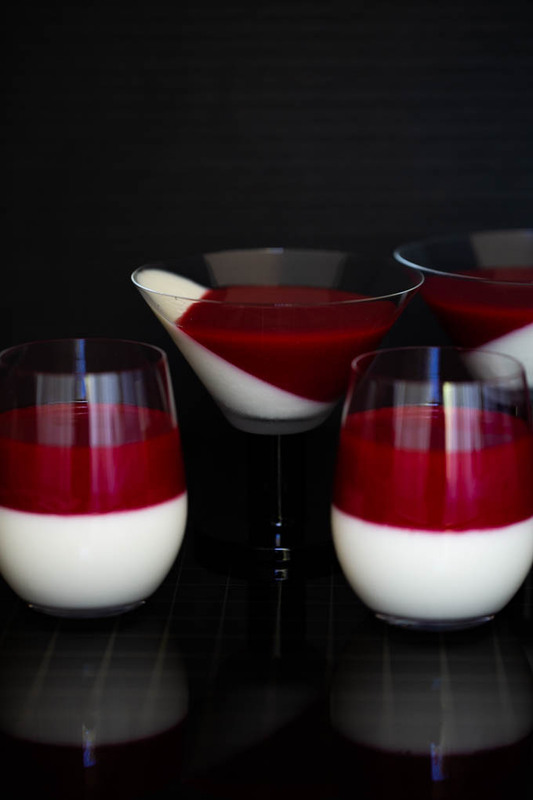 This Easy Panna Cotta with Raspberry Coulis tastes as smooth and luscious as it is stunning to look at! Tip: I’d suggest prepping this a day ahead. Once completely cooled, cover each glass with Press ‘n Seal a favorite of mine. It doesn’t let any air seep in – keeping the Panna Cotta fresh, not dried out! 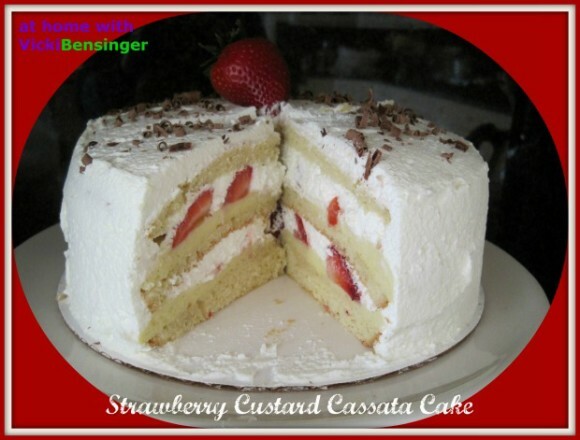 This holiday dessert will wow your guests and satisfy their palate! 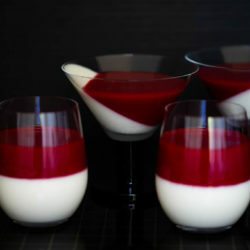 Panna Cotta: Dissolve gelatin in 2 tablespoons of cold water. Let swell for about 5 to 10 minutes. In a medium saucepan bring cream, milk and sugar to a simmer over medium-low heat (Do not boil – bubbles will form around the edge of the pan). When sugar has dissolved remove from heat. Add vanilla extract. Allow to cool for 5 minutes before adding gelatin. Add gelatin to cream mixture. Stir until gelatin has completely dissolved. Pour into 4oz. – 5oz. serving glasses. (I used martini & wine glasses). Refrigerate 4 hours or overnight until set. Raspberry Coulis: To prepare the coulis wash the raspberries; drain well. In a small saucepan put berries, sugar and water. Bring to a simmer and remove from heat immediately. Using an immersion blender puree raspberry mixture. Alternatively: Pour warmed berries into a blender or food processor and blend mixture until smooth. Using a mesh strainer pour coulis into a clean bowl, removing the seeds. Allow raspberry coulis to reach room temperature. Then cover and refrigerate until ready to serve. Note: To get the slanted effect, use a rectangular or round pan with a paper towel or cloth on the bottom. Tilt your individual serving glasses onto the edge of the pan alternating from one side to the next. If needed use additional paper towels to support the glasses. In one fluid motion, pour the cream mixture into the glasses, being sure not to overflow. Then carefully place in refrigerator to chill until completely set before adding coulis.